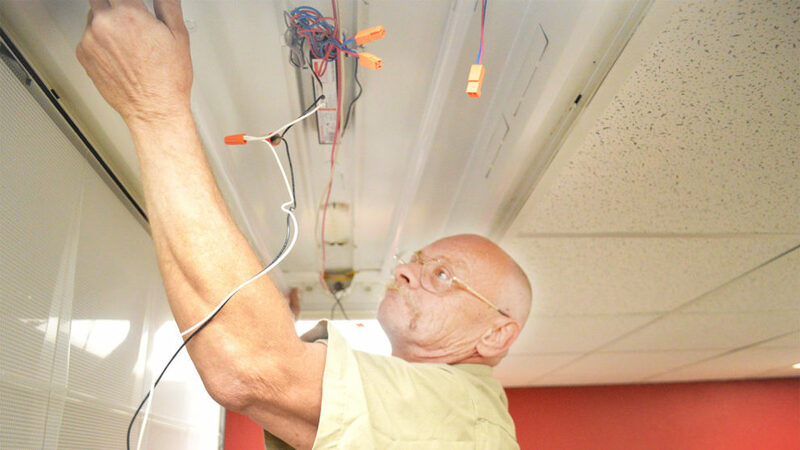 Scott Hoover, an employee of NC State Construction Services, installs an LED retrofit at Price Music Center, which is the university’s first building with all LED lighting. With the exception of two large rehearsal halls that received new lighting and fixtures, most of the existing lighting fixtures in the building were retrofitted with LEDs to reduce cost and waste. NC State’s Department of Music has never been brighter. In May, the department’s primary building ‒ the 24,000-square-foot Price Music Center ‒ received a lighting upgrade, making it the first campus facility completely outfitted with energy-efficient LEDs (light-emitting diodes). The existing fluorescent lighting was replaced with a combination of new LED fixtures, as well as more than 300 LED retrofit kits. According to the U.S. Department of Energy, LED technology uses less energy and lasts longer than other types of lighting. In a building such as Price, where most of the fluorescent lighting had not been updated since the building’s 1972 construction, the upgrade’s energy savings will offset the project’s cost in just a few years. The new lights have less than half of the installed wattage as the old lighting, and with occupancy sensors installed, are expected to use less than one-third of the lighting energy as before. Additionally, the upgrade boosts lighting consistency and quality for the thousands of student musicians who use the facility each year. NC State Energy Management funded the project, which also included new occupancy sensors and surge protection devices that protect the LED investment and ensure long life. Though several University Housing residence halls ‒ including Wolf Ridge Apartments and Bragaw Hall ‒ are mostly LED, Price is the first campus building with LED lighting throughout. Future campus facilities such as Fitts-Woolard Hall and Plant Sciences Building will feature all LED lighting from the start. “We are excited to be the first all-LED building on campus and for the impact these changes will have on our students and programs for years to come,” Monek said.